Rate constants are as important to examine as affinities – compounds with similar affinities but different kinetics behave differently in physiological environments. For instance, high affinity compounds with slow binding kinetics remain bound to the target over long periods and are protected from the cellular export machinery, degradation and modification. 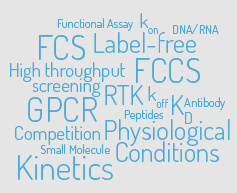 Assay formats for such compounds need to be stable over a long time frame – a challenging requirement for test systems relying on purified active proteins. Since Intana Bioscience measurements are performed in physiological environment, this allows us to conduct kinetic studies on slow-binding molecules. To assess the rate constants, time-resolved measurements are carried out at different concentrations of labeled ligand. This will result in binding curves with different observed rate constants (kobs). When plotted against the concentration of labeled ligand, the kobs values will result in a straight line, the slope of which is kon value and the y-intercept the koff value.